If you are a classic air-cooled Volkswagen lover like I am, then chances are that you either own, or are looking to buy, a classic VW Beetle. The Volkswagen Beetle, or Bug as called by many people, has been a favorite around the world for decades, and is one of the longest production cars in existence, starting in 1938 and ending in 2003. 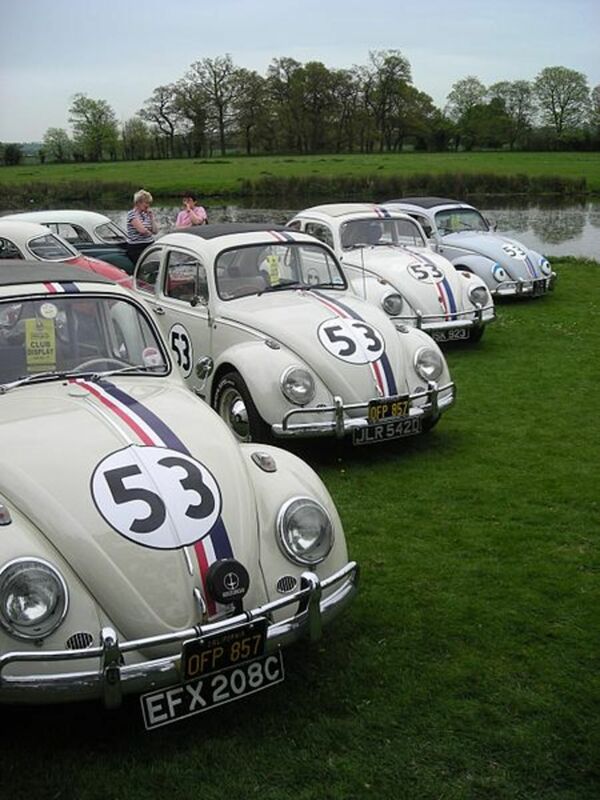 Herbie the Love Bug is the most popular and well known Beetle in the world. His first appearance was in Disney's 'The Love Bug' in 1968. Herbie was my first glimpse at a Beetle and my obsession has continued ever since. One of the primary items to consider when shopping for your Beetle is, are you looking for a car that you can drive right away, or a project. Another thing to consider if it will be a project is, how involved do you want to get and how much money are you willing to spend? There are plenty of these great little 'Bugs' still roaming around the world, many in great shape. Some, not in such great shape. You just need to weed out the bad apples. 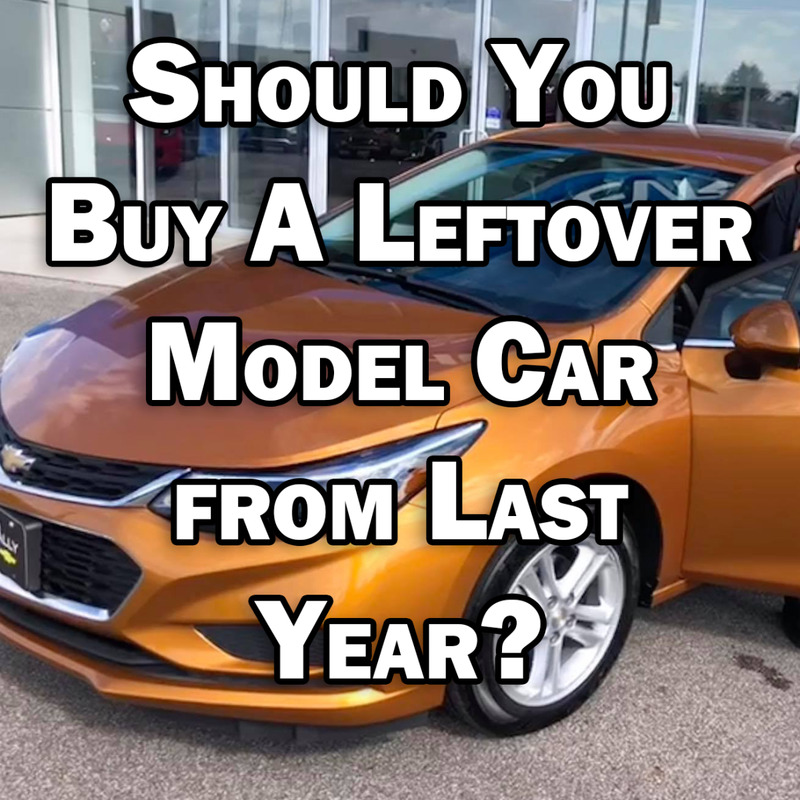 I will go over some key points of interest when shopping for your new 'Baby' and provide helpful links to give you the most information before you buy. The first thing that you need to decide when looking at a Beetle, is whether you want to buy a driver, that you can purchase, and not have to do much but maintenance, or a project, that will need some TLC before it hits the open road. Drivers of course will have a much higher starting price tag initially; however, you will need to check things over really well. This choice is more for those that are either not inclined to do body work, or mechanical repairs. Don't fret though, the Beetle is one of the EASIEST of cars to work on and there is a vast amount of information available to help you do so. I will discuss that later. Buying a project can be a little tricky. But if you know what you are looking for, you can find yourself a very good deal. Projects vary in severity; from just needing an engine all the way to being a complete 'rust bucket'. Decide how much labor you are willing to put into the project, inspect the areas of interest as outlined below and go from there. Many VW Beetles are left to rot even though they have a great deal of potential; Especially pre 1967 models. When looking at a Beetle, take a few things with you, whether you are looking for a driver or a project, they will be very useful. A small awl or screwdriver: This will help you find the bad rust areas of the car. If you see a spot that looks bad, give it a poke. If it goes through, well, there will be some welding involved. Small magnet: This will help you discover an overabundance of body filler. The magnet that I use will not stick to metal that has much more than 1/8 inch of filler on top of it. Small flashlight: You'll need it to check out areas under the car. Socket set and a large crescent wrench: These are handy in the engine compartment. You may also want to take along a battery, a small can of gasoline, some starting fluid, and jumper cables. You would be surprised at how much these will become useful when looking at a Beetle that has been sitting in the weeds for a few years. This is one of the first places to rot out on a Beetle. Since the car is air cooled, heat must be transferred to the front of the car through the rocker panels just below the door. Since these are constantly moving hot air, condensation occurs during cool down. A prime area for rust to form. Look primarily above the jack support of the car and poke and prod if you can. Check all the way to the front. 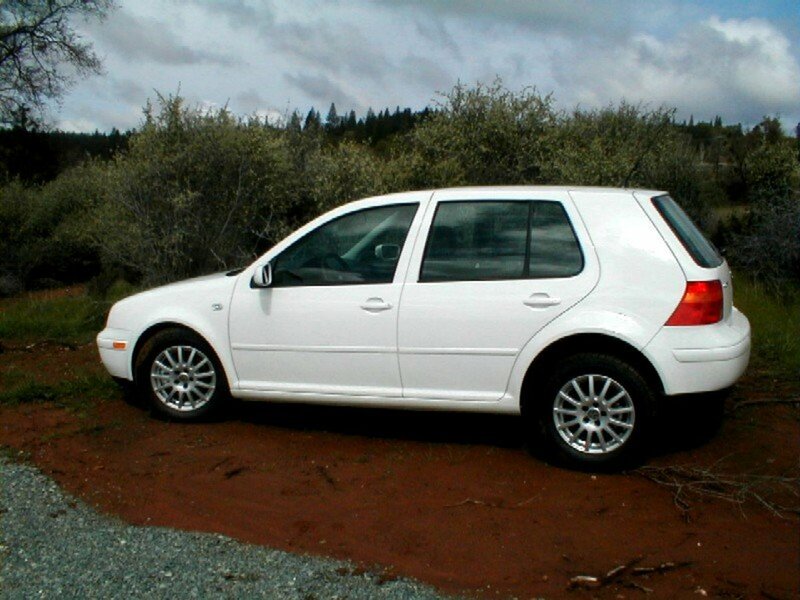 When manufactured, Volkswagen put either a bag of filler material or expanding foam inside the quarter panel to reduce noise and also as a vapor barrier from the engine compartment to the passenger compartment. This filler or foam collected condensation and run-off water (especially on 1970+ models with the small crescent vent behind the rear windows). Major evidence of rot will appear as bubbles in the paint. The larger the bubble, the larger the problem. Just behind the back seat of a Beetle is the Package tray. Since the trunk is rather limited, this is extra storage for passenger items like luggage or groceries. You will need to be able to lift any covering that is on this area to inspect properly. If you can't lift the covering, the just apply pressure straight down onto it in as many places as possible. If you hear any 'Crunching' sounds or worse, if your hand goes through, then the tray will need replaced. This is probably the most common repair area of Beetles. It's fairly easy to detect rot in any of these areas, but the most common is under the battery, which is under the rear seat. Also lift the floor mats if possible to check for more. Replacing the pans can be done in a weekend if necessary. 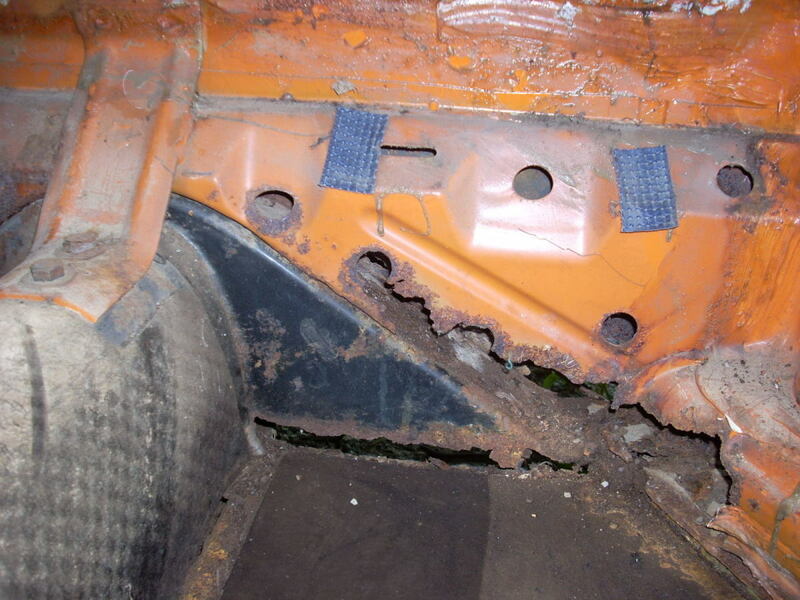 Under the back seat is the rear cross member, where the body is bolted to the chassis. 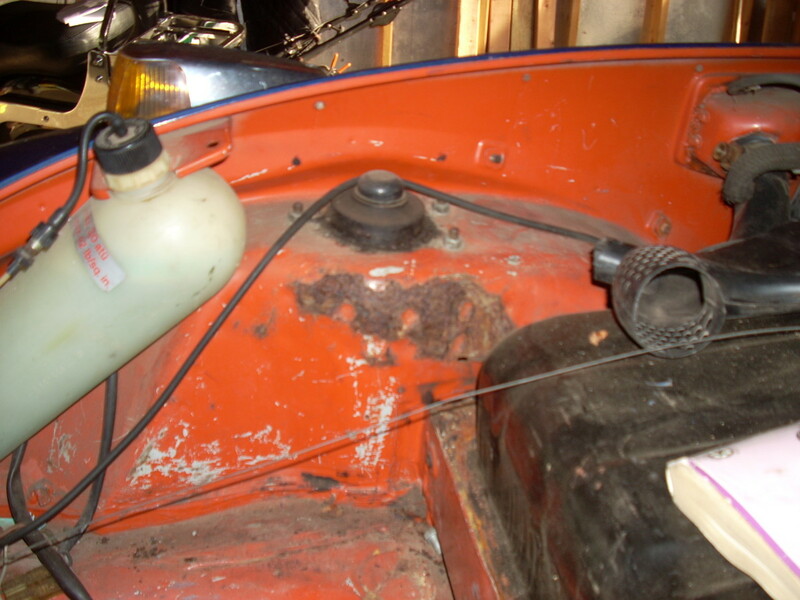 The heater tubes from the engine compartment come through this area to feed the heater channels. This area will sometimes rot out from road dirt collecting on the underside and holding water. Rot here should be easy to detect but feel around the area behind the heater tube since it's not as easily visible. All four fenders on a Beetle are bolted to the body, with a rubber strip separating them from the body. This area likes to collect dirt and grime, and eventually, rust if not attended to. 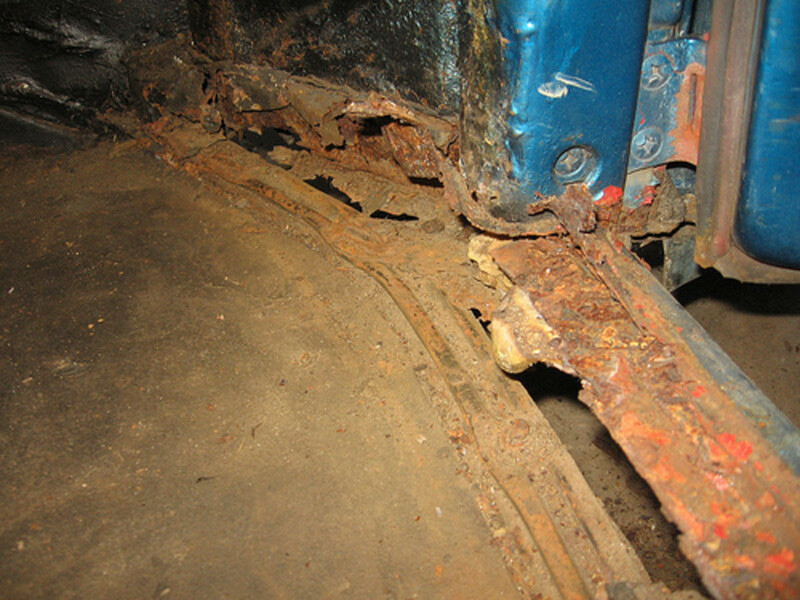 If rust is not evident on the surface of these areas, check inside each fender well with a flashlight. The trunk seal can only do so much to keep water out of the trunk, and eventually they do go bad. Make sure that if there is a spare tire in the spare tire well; remove it and check for rust in the trough below it. Water will collect in this area and rot it out. *** Note that on a Super Beetle, the spare tire lays flat instead of being upright. The Beetle frame is a pretty interesting creature. It consists of a long 'tunnel' that runs down the center of the car, which is the bulk of the support for the suspension and drive train. At the front of that tunnel is the 'Frame Head' which is where the front suspension, or beam is bolted on. It's slightly triangular in shape and is directly below the gas tank. Usually you will see rot in the bottom of the frame head first. Note that Super Beetles do not have a beam, but instead have a MacPherson strut setup, though the frame head is still prone to rust. 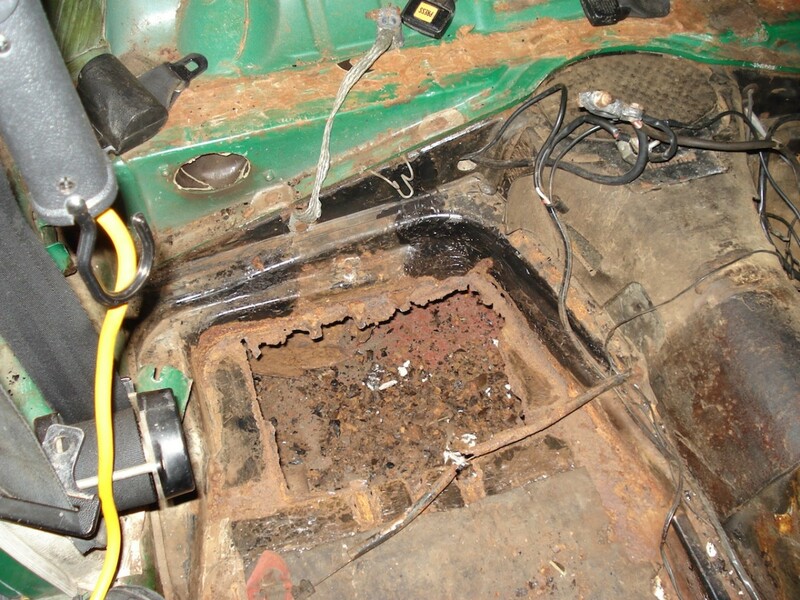 The panel that separates the passenger compartment from the trunk sometimes rots out at the bottom. This is from moisture finding its way either through the heater channels or through the trunk and sitting in the bottom. This area is most easily seen by removing the gas tank, but can also be viewed from under the car. 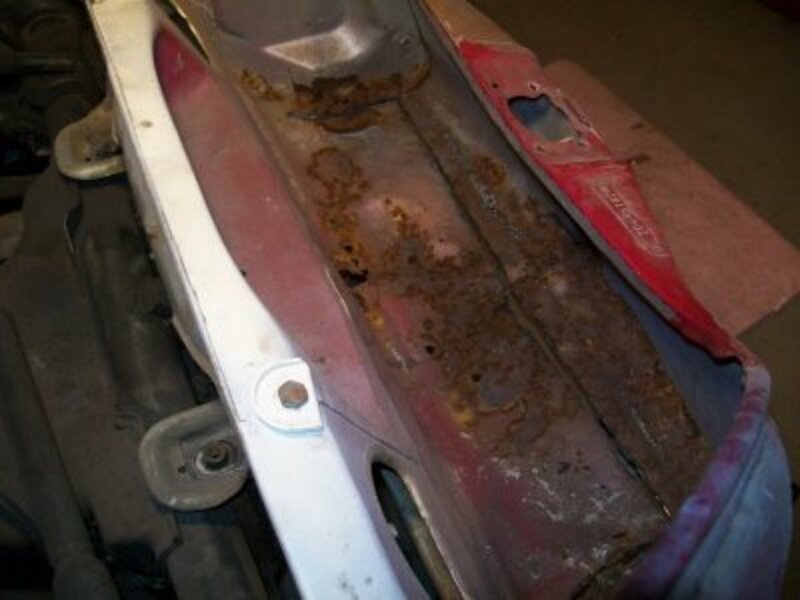 Rust usually starts in the bottom outside corners where it meets the heater channels. Under the trunk lid, you will find the front strut towers. 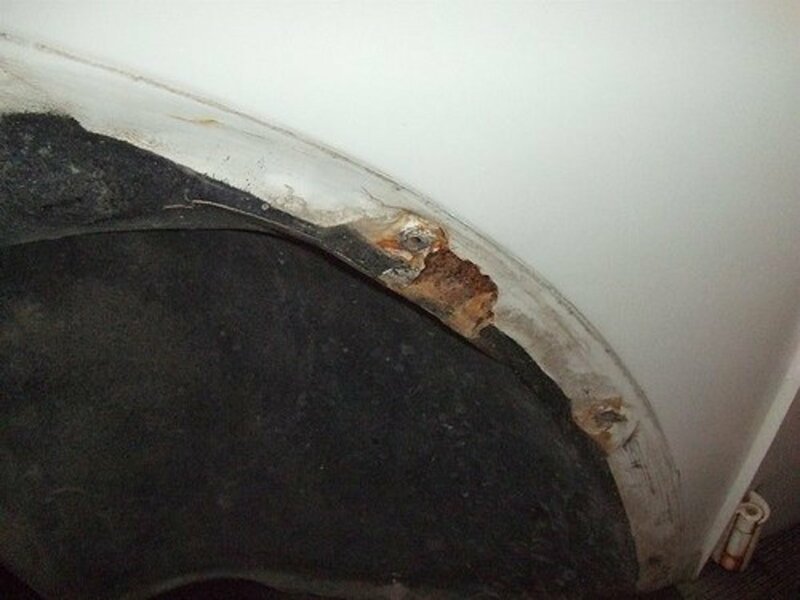 Found only on the Super Beetle model, these areas sometimes rot out causing the front suspension to be weakened. This area needs to be solid for the car to be safe. Replacement parts are available if it is rotted. 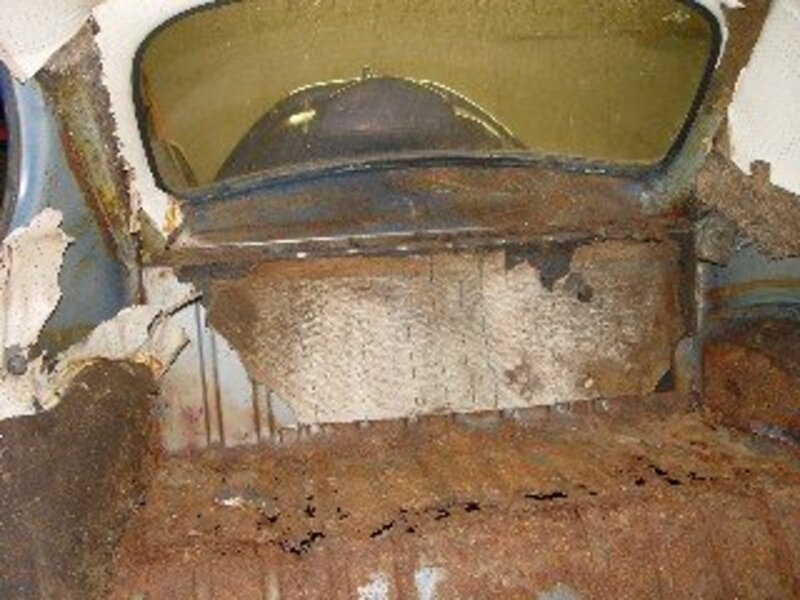 This covers most of the real rust problem areas on the classic aircooled VW Beetle. Please note that this information may vary a bit by year, but for a general guide, it is pretty accurate and should provide you with a very good starting point. After sitting a few years, classic Beetles can be a little hard to start. The owner may tell you that the engine was rebuilt just before it was parked. This however doesn't necessarily mean that the engine is usable. 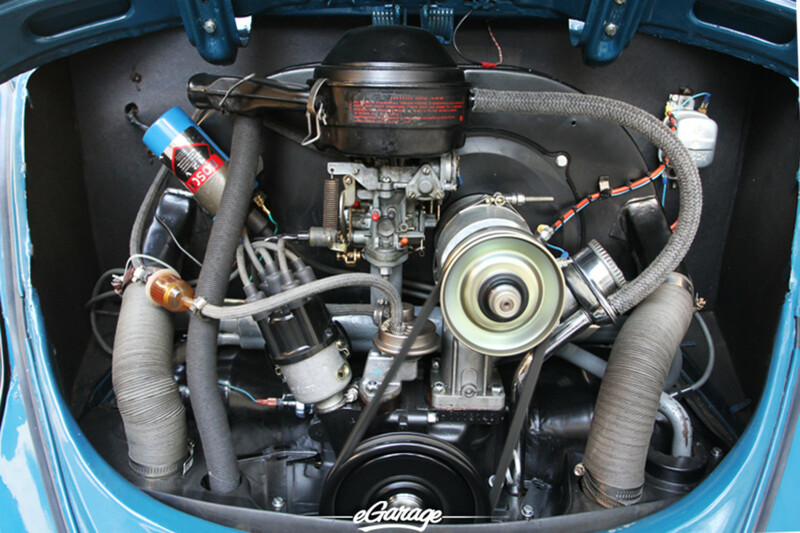 Aircooled Beetles utilize a horizontally opposed flat four cylinder configuration. If water creeps into the motor via the carburetor or other entryway, it can easily make it's way to the cylinders and cause them to rust to the piston rings. The valves are also prone to damage from this as well. Visually inspect the engine to see that there are no apparent missing pieces. I looked at a Beetle once that the previous owner said was running just a few months before. When looking at the engine, the carburetor was missing. I finally discovered that over time water condensation had gone down through the intake manifold and rusted one of the pistons to the cylinder. 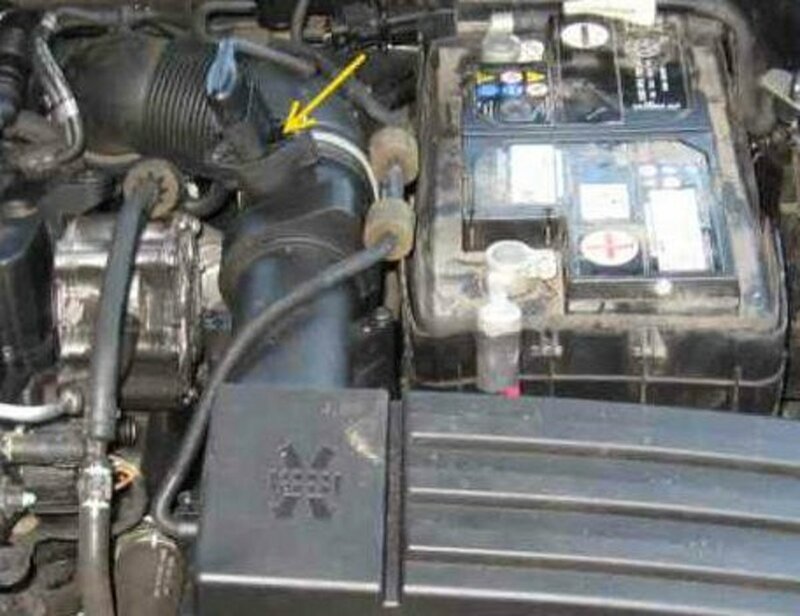 Take the spark plugs out of the engine and squirt a few shots of WD-40 or other penetrating oil into each cylinder. Then, using a large wrench, try to turn the motor at the crank pulley. If it doesn't turn, the engine has some major issues and will most likely need to be rebuilt or replaced. Try and start it! If the engine turns freely, and it appears that all of the components are there, then go for it! This is why you brought the battery, gas, starting fluid and jumper cables! You may just find that the engine runs fine. After you get it started, check for smoke coming from the exhaust, or any odd noises. Knocking or heavy pinging noises are BAD. The fuse block on a Beetle is located instide the trunk on the drivers side just in front of the stereo speaker (if it's still there). Check to make sure all of the wires are plugged onto the block and all relays are present. Also check to make sure there are no brittle wires or burned wires. Rewiring a Beete is a pretty involved project. 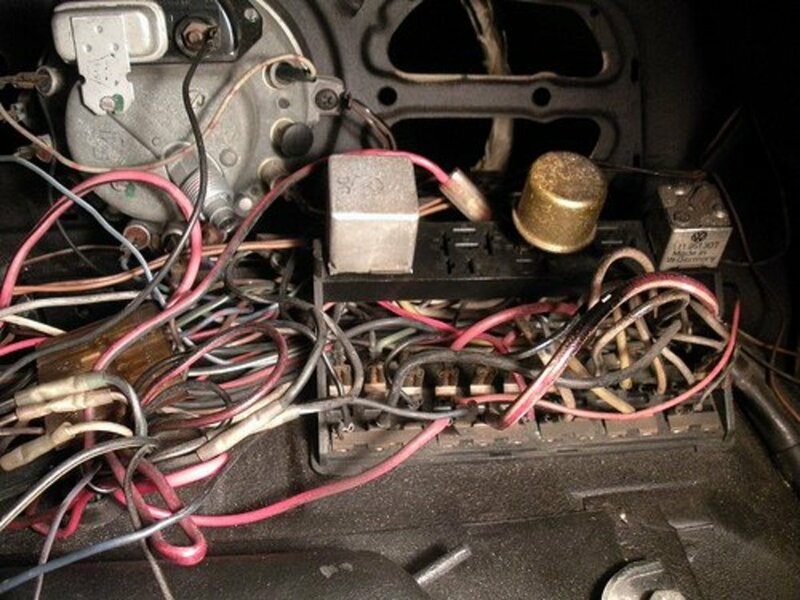 If needed, there are quite a few sites that sell wiring harnesses for Classic Bugs. Check my helpful links Hub for information on this. Ok, so if all went well here, then you have a pretty good understanding of where to look on a classic air-cooled VW Beetle for problems and how to detect them. Remember to never take anyones word that a vehicle is in great condition no matter how it looks. YOU be the judge. Buying a Classic VW Beetle : "My all time favorite car has to be the Volkswagen Beetle. What is not to love about these little cars. I think my love affair started with this car when my mother took us to see Herbie, The Love Bug at the drive in. I was hooked." Please comment on this article to let me know if it was helpful to you as well as any additions that you think I should make. I have the opportunity to buy 30 Volkswagens from and old man. Probably 22 Volkswagen bugs from 55 to early 70s. 5 square backs and one bus. On top of that a bunch of parts. For 2000 bucks. Most are in poor condition and none have titles. Should I pass it up or buy them? Bought a 1964 beetle. Seems in good shape, drove it home no issues. I'm wondering about the VIN #. I would like to find out as much as possible about it. How to find out the engine size or if it's a numbers matching car???? Thanks so much for reading!!! I'm in the process of piecing together my own 63 Bug right now!!! Very helpful my brother-inlaw has a 1963 that he loves and I love as well. So when I come across anything VW I stop what I'm doing and start reading and I enjoyed your artical. Thank you so much for your time and information. Very helpful. I have a 66 bug with a body in fairly decent shape but needs work and a new engine. Trying to find her a new home. I found a 2001 VW Beetle good conditon, 2300 firm is that good pric? Is there any one or two years to avoid when buying a VW BEETLE? It is really interesting to note in every words about this unique transportation on earth. You are my hero and now i know a little about 1600 super bug convertible which i have to buy this coming tuesday . @The Bean - to repair strut towers, you'll need some welding skills as well at the equipment to do so. Replacement panels are available or you can get them from a doner car. Check TheSamba.com for parts. Hi, there, if there is rust around the strut towers, how difficult is this to repair? Would it have to re-fabricated and welded back together, or are there replacement body parts for that? Thanks. Very informative. I am planning to buy one which I can drive and use right away. This is just what I have been looking for....deep information about Bugs. My first Bug was a brand new 1968 Red Beetle and after many years and replaced engine, it became a Baja Bug. Now I want another Driver Bug with the manual stick and shift. What is the better year for a Driver Bug and the fair price? Thanks Eric for a quick easy explanation of what to look for in a "Bug". Found, what seems to be a good one and not knowing anything about these cars found your info more than informative. The links were helpful also. Thanks, Jack. From Albury, New South Wales, Australia. Excellent article! I am going to look at my first beetle tonight, and thanks to your info, I will know what to look for. If all goes well, I will have this beaut by Sunday! Phillip, sorry for the pokey reply. Day job and the family have me running. A '70 in good running shape with minimal rust and minor interior damage in my area (PA) would sell for right around $3k. This will vary depending on your location. I would suggest looking on TheSamba.com in their classifieds for price comparisons. You may even find a nice ride to buy on there. Ideally, I would like to fly out to California to purchase a '63 or earlier ragtop and then drive it back. They're a lot cheaper and plentiful out west. Better shape too. Hope this helps, although a bit late. @Andrew - $1,200 is a pretty reasonable price for a Beetle in good shape. I would rather deal with engine problems rather than bodywork any day. Even if the current drivetrain is shot, you should be able to get one used fairly cheap. I am looking at a 71 beetle going for $1200. The body and interior is exceptional. The clutch is currently disassembled so I can't test drive. He says its running however I can't confirm for myself. It's super clean and looks great. What's your opinion on the cost? Should I go for it? @ Dazie Blu: Thanks for your comment Dazie. I too have a late Beetle, unfortunately, mine was in pretty bad shape when I got it. As far as how to proceed with what you got, it's completely up to you. It may depend on how much cash you have available or other factors. My dream bug, is a 1963 Ragtop, just like Herbie, but instead, I have a 1976 that is in the process of a complete ground up restoration. I would love to have an older Beetle, but my funds at this point in my life will only allow for a little at a time. I'm sure that when my 76 is done, I'll have many a good day with it. If you absolutely can't seem to get attached to your current Beetle, you could always sell it and put the money toward something you really want. I hope you find your resolution. I collect old cars but not VW's. Article was very helpful. @suplav76 - Honestly, I've dealt with a Beetle or two in the same shape as yours. I don't have to tell you that you have a very good amount of work ahead of you, but I will say that with some time, effort and a few dollars here and there, you can get the 'lil bugger on the road. Replacing a heater channel can be a littl e intimidating if you haven't done one before, but they're not really that bad. You can make a jig to connect the span where the door goes prior to cutting out the bad metal. This will keep the body from twisting out of shape while you are working. Motors are a dime a dozen. Get the body road worthy before even attempting anything back there. Could be something as simple as a bad starter wire. All in all, if you think the car is worth it, don't give up. It'll come together in time. Good luck on your journey and thanks for reading!!! Hi Eric, Thanks for this article, it's kinda put my mind at ease. I bought a 71 Super Beetle the other day as a project for my 12 year old son and I. I used to work on my dad's 66 when I was a kid and figured this would be a great project. I only paid$450 so even if its a complete bust I really didn't lose much. Wow, you are super knowledgeable about the air cooled VW Beetle! My husband is a huge fan and I imagine will someday decide to buy one, so I'll mark this for future reference. This is very comprehensive and useful...no wonder it's been such a popular hub! Wow, really great information sharing. I have already read so much on this topic but your this article has answered so many questions in my mind. This article was really informative and I have learn t so much after reading this. I wonder some day I would be able to share such valuable information on my own blog. Kacee, The cost of a rebuild can vary. It all depends on how in depth you want to go. The 'Knocking' that you are hearing is Most likely the main bearings in the motor. These are fairly cheap to buy, but the motor has to come out of the car and be completely torn down to replace. The bearings themselves will cost roughly $40 US. You will also want to have the engine case align bored. This is needed since, after the bearings wear to a knocking point, they get 'beat in' to the engine case material. Getting a case align bored will cost roughly $75 ~ $100 US. Figure in a gasket kit and any other items the motor needs and you'll probably be about $400 US into the rebuild. I had a similar problem and I opted to buy new parts all over so that I would not need to do it again for quite some time. My fully rebuilt engine which included all new parts including pistons and cylinders cost just over $600 US. 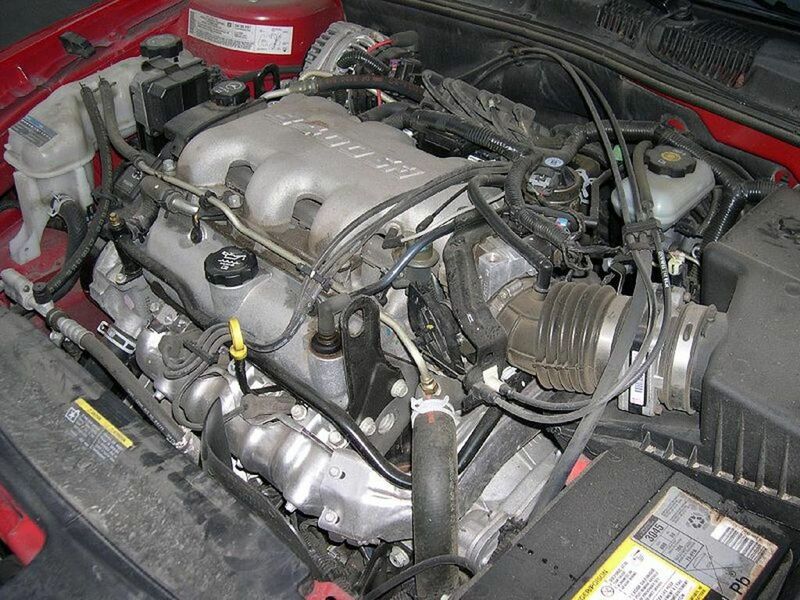 You may also be able to look on thesamba.com and find a used motor cheap that is decent. Overall, $1000 for a decent 1970 is a pretty good deal depending on location. Nice find. was wondering about the "knocking" warning... how BAD is that? I checked on a car today, 1,000.00 for a 1970 needs a front fender, has a knock..... the owner thinks it needs a rebuild? Can you tell me how much that would cost? Article was very informative, I read things that make sense what of what I am up against. I am in the middle of restoring a 72couple Super Bettle that has been in family since 74. Has been worked on and ran off and on since my Father passed away in 2005. @ William.w - Thank you william.w, I have added photos as you suggested and also did mention using WD-40 or other penetrating oil as well. Thanks for catching that! @Marc - I think that $3200 is a reasonable price for a car of that condition. I would check to see how many miles have been put on the engine since the build and get a little background on it. Another factor to consider when thinking about price is the location of the vehicle. Beetles in the East (especially the rust belt) of the United States are generally more expensive than in the west. One thing that I will usually do, is look on TheSamba and price compare similar vehicles from the same region. Otherwise, sounds like you found yourself a nice ride! Good luck and happy motoring!!! Hey Eric, I've been doing a lot of research on VW beetles and actually found a 68 1776cc dual carb that seems to be in great shape based on the basic car repair knowledge I have and this site! no rust, runs great, custom interior and good electrical. Is there anything else I need to looks for? He's asking 4k and I offered 3200 is this sound reasonable? I'm going shopping for a new old beetle this weekend and I am totally going to print this out and bring it with me. Very informative - thanks! I enjoyed your article, your comprehensive. I have been restoring these cars off and on for over 20 years now. I wish someone would have told me these tips years ago. 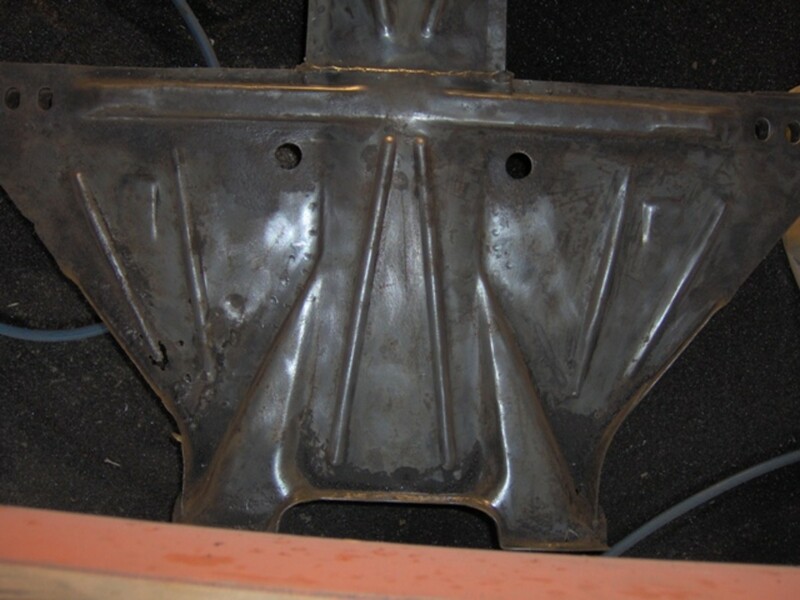 I would include some pictures to go along with your article or a link as that most people may not know where these sections of the car are located. Another trick I have used is a can of WD 40 sprayed in the cylinders through the spark plug holes, let it sit for a half an hour and then turn the crank pully back and forth until a stubborn motor is freed up to turn easily, especially helpful to do if the car has sat for any length of time. It may save someone an immediate rebuild from a snapped ring. Just a note... This Hub was copied by the website beetlebroker.com without my knowledge or consent. Please note that I am in no way affiliated with this company. @Alex - This translates to 'No Comment' correct? 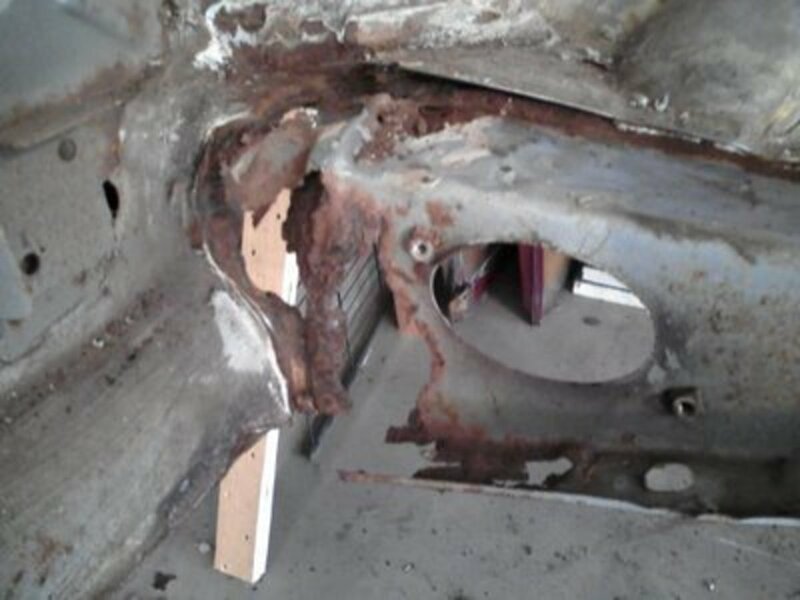 @mick hurley - depending on the amount of rust through, you may be able to repair this section can often be repaired without removing the body completely from the car. You would need access to a welder and of course the sheetmetal to repair the section. You would then unbolt the body and separate it from the pan primarily over the rotted area. Cut it out and replace with the new metal. This could be done over a weekend if you are motivated. Once repaired, I would also recommend a heavy coating of Rust Bullet or POR-15 to prevent further damage. 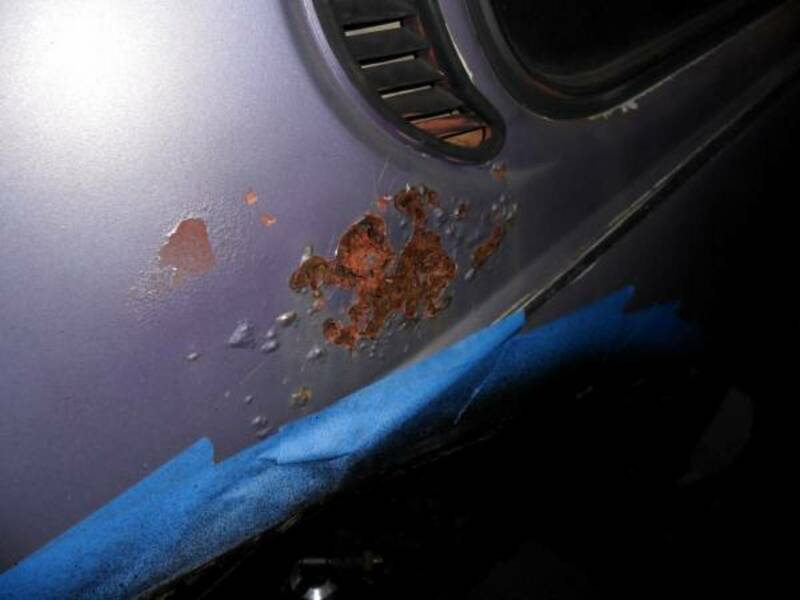 @Herbie67 - For pricing the sale of a 72 will depend on many things like geographic location of the car, how bad is the rust and where is it located? How original is the car? 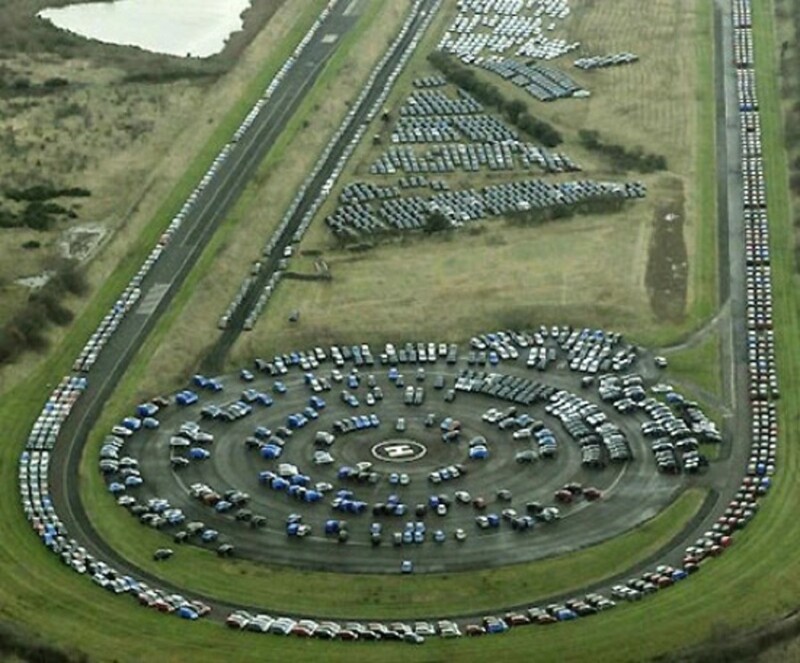 To get a decent idea of what these cars sell for, I would suggest checking out http://www.thesamba.com. This site is my bible when it comes to Beetles. @helmi - I would also checking out the site listed above. It's very comprehensive and has vehicles for sale around the world. You may also consider listing the car in the classified on the site. Good luck! @Lilabuck - Sounds like you have a very solid start with your 71. Presuming that is all the work it needs, then you have a very nice quick project there. Please check out the site that I listed earlier in this comment as it has been a great resource for me during my own build. 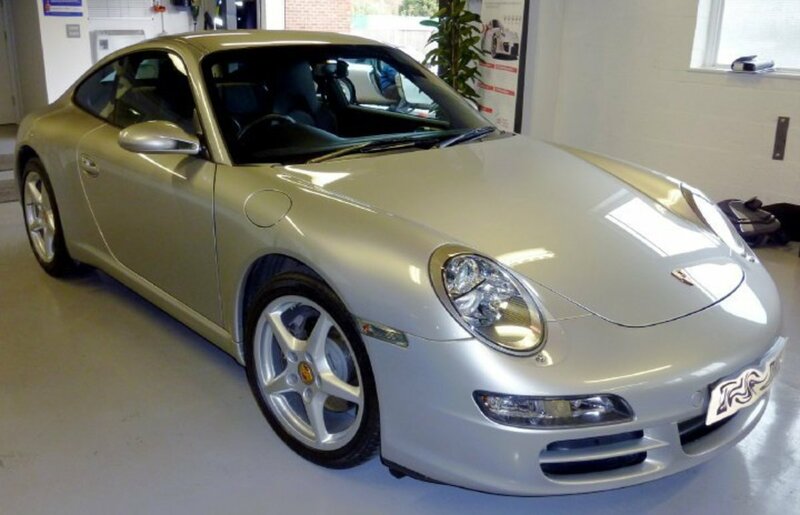 Restoring your vehicle in most cases will only increase the value. There are some cases that you could decrease the value, however you would really have to botch things up. i recently bought a 71 beetle and need to do some work on it like repainting it and some small changed to interior like a new seat belt. any suggestions to where i go to start? also, by restoring it, does it downgrade to value of beetle? Cool Hub eric, I have my own hub too, it's very similar, perhaps a different approach! Need some help. I have a 72 Beetle my husband wants to sell. It has some rust spots on it, but runs great. It has 75590 miles on it. What would be a reasonable price to sell for? Sorry for the laggy response Rick. Been quite busy with the day job lately. In regards to your 72 Marathon Blue Super, provided it's fairly solid, I think that this is a pretty decent find. Be especially sure to check the strut towers as I note above as well as the heater channels. If you are comfortable with any repairs that are needed, I would say go for it! The rust around the cresent vents can vary in severity. Sometimes they consume the outter panel an no more. Other times they may get into the under structure. Mine rotted inside and outside. Being on a tight budget, I decided to fabricate the patches myself and weld them in. this cost me under $50 to complete, however I spent a lot of time doing it. You can see my progress at http://eric2112.blogspot.com. You can also find panel sections on http://www.thesamba.com for pretty cheap. Just remember to stick with the route that you are most comfortable with and all will be well. Hope this helps. Nice article. Very useful tips for first time buyers. I am hoping to get one soon. Is there a website I could locate VW Classic beetle repair shop around Philly. I've been doing casual searches about classic beetles for a few days now, and yours is by far the most useful! Thank you! 8 years ago from Denham Springs,La. A great list. Am looking at buying a bug in the next month or so and this is the best checklist i have found on the net to date. Going over this list also made me realise what a dog of a car I bought ten years ago. Mechanically it was good but it had rust in about half the places you mention. was a great, fun, cheap ride for a first car though. With many fond memories of it I am excited about being a 'dubber again. Will be taking you list with me when I go buying this time though! there's many points that i didn't understand but However, i agree with you that this car was the favorite one for many decads and it's cheap too and the best thing of it , very easy to drive! Thank you so much for writing a cool comprehensive and simple check list. I have wanted a beetle for ever and I am just getting serious about buying one. So I really want to be informed. This is a great introduction in looking for a beetle for me. Detailed enough so you actually could go and do these checks but not so detailed that you need to be a mechanic to understand it. A very comprehensive hub for people looking to buy a VW Beetle. Think in this area of the world people will prefer Camper Vans though!